(ARA) - After another winter’s worth of wear and tear, has your flooring reached the point of no return? Or perhaps you’re just ready for a change. Either way, bringing the beauty of wood flooring into your home is a great way to instantly change the look of a room. From the country feel of oak to the elegance of maple, there is a wood floor for every taste. And now, there is a wood floor that do-it-yourselfers can install easily in about half the time it would take to install regular hardwood floors. Alloc Wood is a collection of beautiful hardwood floors made from the highest quality wood materials that provide real wood beauty, durability, ease of maintenance and installation. The flooring fits together with a snap -- literally. The company’s patented mechanical locking system makes installation easy and the joints tight and strong. The joint locking system aligns the planks precisely, so no messy glue is necessary. 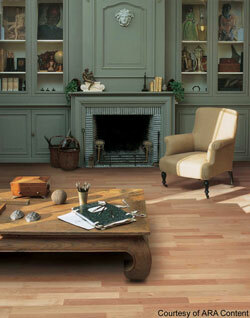 Choose from 11 different finish styles and colors to find one that is perfect for your décor. From the rich, deep colors of Merbau to the light and airy look of Beech Authentic, you can choose a finish to match existing wood in your home, or opt to complement your furniture with a contrasting wood. You can also choose between the traditional three-strip designs, which are just over 8 inches wide, or opt for the recently introduced 6.5-inch one strip plank design. The flooring is pre-finished with Alloc’s Lifestrong surface treatment to provide long wear resistance and years of pleasure. It is perfect for just about any residential area, including foyers, kitchens, living and dining rooms, dens and half-bathrooms. You can install the flooring with confidence: Alloc backs its products with a 25-year warranty. In addition to their wood flooring, Alloc manufactures an entire family of laminate mechanical locking products, including Alloc Commercial, Original, Domestic, Home Flooring and Tile.